I have been getting episodes of acute abdominal pain accompanied by fever on and off for at least 6 months. This past week saw me wake up with one on Saturday and have another on Sunday evening. I went to see the doctor who decided that it sounded like problems with my gallbladder and arranged a sonar examination. 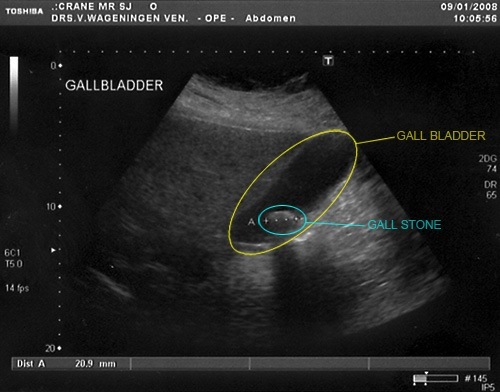 This confirmed a 2cm gallstone and I saw a specialist today who will operate to remove my gall bladder next Thursday. In lieu of any new photographs here is what my sonar results look like. This entry was posted in Thoughts and tagged sonar scan illness gallbladder gallstone gallstones cho. Bookmark the permalink. i hope you are having the laproscopic procedure and i hope it goes well. if you have any questions, send me an email (directly or via dw). Thanks Em. Yes, I’m having the laparoscopic procedure.